The current international sanctions regime that targets Iran is the main obstacle preventing Iran from fully joining the global economy. The most effective sanctions on Iran are the severe restrictions on international money transfers and access to the world banking system. As a result of these restrictions Iran has not been able to receive as much revenue as it used to receive from selling oil and gas. Yet, there is a need and market for Iran’s oil even during sanctions. For example, South Korea raised its import of Iranian oil to 290,714 barrels per day in February 2014, which is almost double last year’s import. The sanctions are not the only problem for international investors. Iran’s protectionist laws, including the Foreign Investment Promotions and Protection Act (FIPPA/ قانون حمایت و تشویق سرمایه گذاری خارجی), endanger the safety of foreign investments. The intention of the lawmakers in passing this law several decades ago was to provide a secure ground to not only encourage foreign investors to invest in Iran and thereby improve the Iranian economy, but also to protect their presently-held foreign investments. However, the latter goal has not in fact been achieved. While this law provides several incentives for the foreign investments such as considerable tax incentives, visa accommodation, and easing and facilitating bureaucratic procedures, it simply fails to provide enough security to the future of investments in Iran. For example, the Iranian government has the liberty to confiscate any accumulated profits or factories whenever it determines that the investment endangers the national interest of the country. An additional obstacle for Iranian business lies in the regulations surrounding foreign oil and gas investment in Iran. Oil and gas are Iran’s two major exports and together provide the country’s main source of income. However, the existing laws do not encourage foreign oil companies to come to Iran and invest in this important industry by instead prohibiting foreign ownership of oil and gas companies. As was mentioned above, these laws also provide the Iranian government with the ability to shut down foreign business and confiscate their properties at its discretion. It seems that the Islamic Republic of Iran’s lawmakers and politicians have never forgotten Mosaddeq’s fate in 1953 and looked at the West with suspicion since then. In August 1953, during Operation AJAX (کودتای ۲۸ مرداد), the U.S. Central Intelligence Agency (CIA) overturned the Iranian Prime Minster, Dr. Mohamad Mosaddeq’s government through a coup d’etat. According to historical documents, the British government that saw its interests in danger after the nationalization of the oil by Mosaddeq in Iran in 195, played a significant role in persuading U.S. President Eisenhower to execute the coup. This historical mistrust convinced the Iranian government not to allow foreigners to gain a significant role in the Iranian oil and gas industry. For instance, the government has not allowed foreigners to have any ownership in the industry, even if the foreign companies perform the entire exploration or build an entire facility. Even if the new generation of oil contracts promised by the new Iranian Oil Minister addresses these issues, the laws still must change to ensure that in the future the government cannot abolish or alter contracts. Anything less will make investors wary of Iran. Despite these major obstacles to investment in Iran, several major developments appear to be improving the country’s overall investment climate. 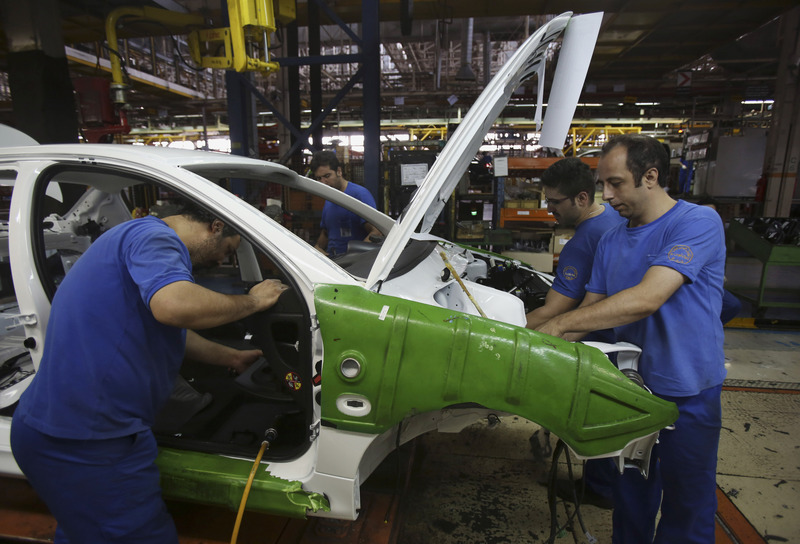 For one, the Iranian economy has improved significantly in recent months. 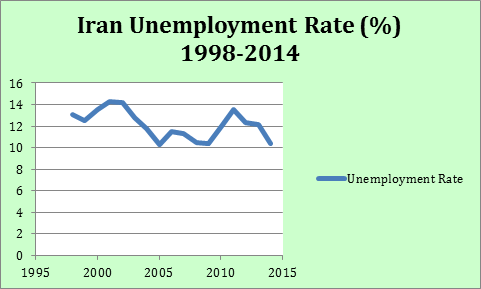 Figure 2: Iran Unemployment Rate (%), 1998-2014. Source: Office of the Vice President of The Islamic Republic of Iran-Planning and Strategic Supervision Organization-Iran Statistics Center. Tehran’s stock market also performed very well last year. Its index was up by 130% (Dollar-denominated) in 2013. This was in part the result of an increase in the profits of the companies following a decrease in inflation and a relative stabilization of the exchange rate compared to the fluctuations under President Ahmadinejad. In addition, the people and investors showed more interest in buying stocks that raised the demand in the stock market. Also, several companies received new investments and raised the amount of their capital investment, which resulted in a rapid increase in the value of their stocks. This not only made stockholders happier but also created an ambiance of trust among the potential investors that encouraged investment in the stock market. Despite this, foreign investors still hold only 0.5% of Iranian stocks; thus clearly there is still plenty of room for foreign investors. The Iranian banking sector has also recently witnessed impressive growth. Iranian banks have enjoyed a rate of 35% growth in total investments from last year, while bank revenues have increased by 30% over the same period. This increase in the amount of investments in the banks is the result of a rise in investors’ trust in the banks. These funds have been deposited in investment saving accounts with a 20% “official” annual interest rate for long-term investments accounts. People that have large amounts of cash used to keep it in gold or foreign currency, but this year higher interest rates drove their money into the banking sector, specifically in accounts known in Persian as “Seporde Sarmayegozari-e Boland Moddat (سپرده سرمایه گذاری بلند مدت).” Opening these accounts requires a minimum down payment and the signature of a contractual obligation that requires him/her not to withdraw the invested money or down payment after one, two, three, four, or five years, depending on the term of the contract. The five-year contract is most common, because one is allowed to withdraw the money after one year without paying a penalty. 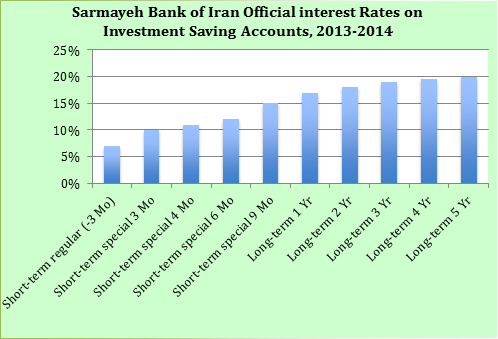 Figure 3: Sarmayeh Bank of Iran (بانک سرمایه) Official Interest Rates on Investment Saving Accounts. “Mo” stands for Month and “Yr” stands for Year. Source: Sarmayeh Bank. The reason why banks assign different interest rates to different year terms, with maximum interest on a five-year term, is that Iran’s Central Bank lowered the interest rates following the implementation of a plan by former President Mahmoud Ahmadinejad that he believed could encourage small business owners to get loans with lower interest rates from banks and thereby create jobs. Investors that wished to receive the maximum interest rate (20% per year) had to keep their money in the banks for 5 years; otherwise, they would have to pay a penalty for early withdrawal. Of course, any investor who wished to keep his or her money in the bank for a shorter period would receive much less annual interest. 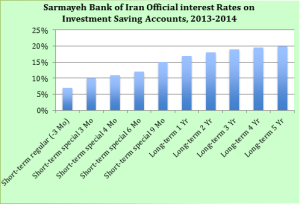 As a result, saving accounts became less popular among the Iranians. Instead, the cash flow went toward buying foreign currencies and gold. After the devastating impacts of such policies became apparent, the banks found a loophole while The Central Bank of Iran chose to keep silent about it to save face. The banks extended the number of years to five years in the investment saving accounts’ contracts and lowered the maturation period to one year. As a result, while the investors received the maximum interest rate (20% per year) on their investment saving accounts, they were able to withdraw their money after the maturation period that was one year without paying any penalty to the bank. Yet, after the election of President Rohani, banks have more freedom to raise interest rates from a maximum of 20% (during Ahmadinejad) to 22%, and in some cases, up to 26%. This has encouraged small savers to invest more in investment savings accounts. This increase in the interest rates for investment saving accounts this year occurred as a result of the decrease in the inflation rate from 42.5% to 35% in this Persian New Year (beginning in March 20, 2014). This difference between the actual inflation rate (35%) and the interests on investment saving accounts (maximum 26%) increased the banking sector’s real revenues. However for the same reason, the individuals who have deposited their capital in these accounts are losing money at least at the amount of this difference. So far, after the election of President Hasan Rohani, the banks have experienced an improved economic environment. Investors are also enjoying better turnover on their investments because the interest rates are higher while the inflation rates are lower than they were under President Ahmadinejad. Another major shift in the Iranian investment climate has come in the direction of the country as of last year toward what is called “resilient economic policy” (اقتصاد مقاومتی) by the supreme leader. This policy calls for less dependency on oil revenue, an increase in domestic production, and decreasing imports. The Iranian government wants to encourage foreign investors to come to Iran while preparing for even tougher sanctions in case the negotiations with 5+1 (the five permanent members of the United Nation’s Security Council including China, the United States, Russia, United Kingdom, France plus Germany) do not succeed. Clearly, the government also wants to minimize the possible negative impacts of an oil embargo if that happens in the future. We should not forget that Iranian politicians are well aware of the huge potential of the Iranian economy and would like to expand it through increasing foreign investment, while at the same time ensuring they are protected from the impact of sanctions if they become more intense. This is not the first time that the Iranians have tried to put such a policy to work. One of the principals for the Islamic Republic that Ayatollah Khomeini emphasized on it after his becoming the first supreme leader of the country was what he called “self-sufficiency (خودکفایی).” Particularly during the eight years of the Iran-Iraq war (1980-1988) in which Iran was under international sanctions, Iranian decision makers tried to lessen their dependency on Western imports of types varying from technology to raw materials to finished goods. The oil and gas industries, auto manufacturing, steel and alloy factories, and weapons manufacturing were among the first industries that started putting this policy into practice, and the results proved to be successful. While today Iran is not at war, there are a series of heavy sanctions with which the Iranian economy needs to contend. The sanctions may reduce Iran’s access to some key import goods and technologies and decrease the country’s income from oil, but at the same time may also encourage the decision makers to actively revive the well-proven self-sufficiency policies. However, under the current sanctions the Iranian politicians have far more foreign currency in their reserves and have possessed much more sophisticated technologies compared to those in 1980-1988. Therefore, the performance of self-sufficiency policy under a new name (resiliency) is plausible. This could also encourage foreign investors to invest in non-traditional Iranian industries. If the investors see a country with industries that are moving forward regardless of the sanctions and outside pressures, they may feel more confident in investing. Another aspect of this plan that has not been fully tested but may become the most challenging part of the resiliency plan is to reduce the country’s dependency on oil and gas revenues. Still, while Iran is very dependent on its oil and gas, it also has diverse active and potential economic and industrial sectors such as auto manufacturing, agriculture, engineering, mining, electrical, and construction. The French auto manufacturer Renault has already begun negotiations with the Rohani government to return to Iran, while others like Peugeot are considering their return. Iran’s diverse industries make it dramatically different from other major oil-producing states in the world such as Kuwait, Qatar, and Saudi Arabia that are closer to pure petro-states. Still, the economic resiliency plan cannot come to fruition without growth in other major industries such as auto manufacturing, steel and alloy manufacturing, and utilities (water and electricity). One part of the expansion in non-oil industries is the development of required technologies that seem to be less significant for the country. For instance, the Iranian uranium enrichment facilities and nuclear power plant need a reliable network of electricity supply as well as a secure and well-functioning information technology (IT) sector. Even for the auto-manufacturing and missile industries, knowledge and technologies are just as important as the raw materials. Yet, lack of investment, especially massive foreign investment, still remains a big issue. However, the government may be able to mitigate the problem by increasing its investment from the oil revenues. Offering more attractive contracts to foreign investors in different forms, particularly joint venture contracts that provide more profit for foreign companies, especially in auto manufacturing, would provide good incentives for foreign investors to invest in Iran. One good sign for those counting on the success of the economic diversification plan away from oil and gas has come in the aftermath of President Rohani’s appointment of Bijan Namdar Zanganeh (بیژن نامدار زنگنه) as Iranian oil minister in August 2013. Mr. Zanganeh told the media during the First Conference on Revision of Iran’s Oil Contracts in Tehran in February 2014 that his ministry is pursuing a major change in contracts. He mentioned that his ministry’s goal is not only to boost the profit and appeal to the foreign investment influx but also mentioned that their “most important purpose in interacting with the foreign companies is to gain access to the advanced technology and management in the oil industry.” Mehdi Hosseini, the Oil Minister’s advisor told the media that the new generation of oil contracts would be introduced in July 2014. How far the oil ministry can go with this new generation of contracts, and to what extent they may allow foreign companies to partially own the oil and gas fields or facilities, are among the crucial questions that need to be addressed before inviting foreign companies to invest in Iran. Iran’s relations with Oman provide an excellent example of the type of economic relationship with other countries that Iran would like to promote through its “resilient economic policy.” While oil and gas have naturally played an important part in the relationship, in fact a very significant portion of the economic relationship is based on trade with other business sectors in Iran. On March 12, 2014, during Iranian President Hassan Rohani’s visit to Oman, the two countries signed a preliminary agreement to build a $1 billion submarine pipeline for export of gas from Iran to gas-hungry Oman. This agreement builds on a memorandum of understanding signed in 2009. The 124-mile pipeline will deliver 10 billion cubic meters of gas annually starting at the end of 2017. Iran and Oman have had “special relations” since at least 1973 when the Iranian government under the Shah assisted Sultan Qaboos bin Said Al Said in suppressing the Dhofar rebellion. After Iran’s 1979 revolution, the Islamic Republic of Iran significantly reinforced and expanded economic and other relations with Oman. A large portion of this economic relationship has indeed been based on oil and gas. For instance, in September 2008, Iran and Oman started negotiations to use Oman’s liquefied natural gas (LNG) facilities to transform Iranian natural gas from the Kish Island gas fields into LNG. In August 2009, Iran and Oman signed an agreement according to which the Oman Oil Company would fund a project worth $12 billion to develop Kish oil field pipelines for the National Iranian Oil Company. This pipeline would be used to export 28 million cubic meters per day (McM/day) to Oman. Moreover, in March 2014, Iran officially started negotiation with Oman and India to build a deep-water 1,400-kilometer gas pipeline to export Iranian gas first to Oman and then from Oman to India (IOI). An Indian company, South Asia Gas Enterprise Pvt. 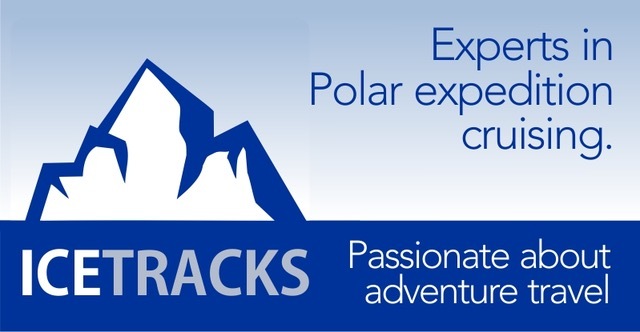 Ltd. (SAGE) has already done the feasibility studies. The project may cost $4.5 billion and could transfer 31 million cubic meters of gas per day to India. This project may be an alternative to the Iran-Pakistan (IP) 781-kilometer pipeline that has been postponed several times due to the lack of cooperation from Pakistani side. Of course Oman, as a transit country, can reap great benefit from this pipeline, either through use of the gas internally or by processing it and exporting it in the form of LNG. However, the reationship between Iran and Oman is not based only on oil and gas. In March 2010, Iran’s Sunir Company won a contract to build a water pipeline through the al-Jabal al-Akhdar resort. Oman’s Public Authority supervised the project for Electricity and Water. In April 23, 2014, Iran announced that it had also agreed to a plan to build a 400-bed hospital in Oman, which will be completed in three years. The hospital is a part of a larger plan to build one of the most advanced medical complexes in the Persian Gulf region that includes various medical facilities such as a pharmaceutical factory, hotels, and advanced surgical unites. The cadre is planned to consist of 80% Iranians and 20% from the Iranians based in the United Kingdom and the United States. Furthermore, by July 2013, Iran and Oman’s annual trade was about $250 million, $170 million of which consisted of Iran’s exports to Oman, particularly food, industrial and electrical products, as wells as engineering services in building and improving power plants, refineries, roads, airports, and water and sewage systems. Looking ahead, Oman has numerous other projects that provide opportunities for Iranian engineering firms. In November 2013, for example, a South Korean joint venture with Daelim Industrial Company won a $2.1 billion contract for a refinery project from Oman Oil Refineries and Petroleum Industries Company (ORPIC). Oman Oil Refineries and Petroleum Industries Co. is seeking a $3 billion loan from international lenders. Oman’s state-owned company will spend $2 billion of this amount upgrading the Sohar oil refinery and $1 billion refinancing the debt. To expand economic activities in Oman, Iran can cooperate with Oman on these projects as well as future projects in construction, pharmaceuticals, medicine, auto manufacturing, and water treatment, for example. In this way, Oman provides an important example of how the Iranian economy can flourish even given international sanctions. Specifically, like it has done in Oman, Iran can export not only oil and natural gas, but also several other kinds of products and services. Iran is an emerging market with plentiful opportunities for foreign investment in various sectors such as oil and gas, auto manufacturing, agriculture, electrical facilities, and construction. If the sanctions are lifted, the Iranian government will still need to revise its protectionist laws, rewrite foreign investment acts to protect and secure foreign investments, and control the economic activities of the IRGC and Bonyads, in order to allow for fair competition with foreign companies for investment projects. In this regard, the Iranian government should encourage and implement transparency, especially when a foreign company is competing with a domestic company or a revolutionary foundation to win a contract. Moreover, the newly-elected government in Iran should continue its policy of “reducing tensions” (سیاست تنش زدایی). Rohani has already helped to reinvigorate some sectors such as housing and banking through his relatively liberal foreign policy; therefore, he should keep the nuclear negotiations alive and at the same time stop the traditional anti-Israel and anti-American slogans. Iran-Oman economic cooperation is a good example that demonstrates Iran’s ability to play a positive role in the region. On the other hand, the recent achievements of the Islamic State in Iraq and Levant (ISIS, داعشin Arabic), especially their rapid military victories in Iraq and their fast progress towards the U.S. allies’ borders in the region such as Jordan, Israel, and Turkey, encourage U.S. and Iran security cooperation in the Middle East. While Israel may feel uncomfortable about this cooperation, if Israel and Iran find a bigger common enemy which poses an essential threat to Israel and Iran, namely ISIS, Israel’s fear of US diplomacy with Iran may disappear. Therefore, in the long-run, Iran’s cooperation with the West may not only help the U.S. and its allies in the region but may also help Iran to lift the sanctions and expand its economic activities globally. Reza Yeganehshakib holds a Ph.D. in history with a specialization in World and Middle Eastern history at the University of California, Irvine (UCI). He received a B.S. degree in Chemical Engineering from Iran Azad University, and an M.A. in history from UCI, where he serves as a Research Associate at the Samuel Jordan Center for Persian Studies. Dr. Yeganehshakib is a member of the Middle East Studies Association and the International Society for Iranian Studies. He is affiliated with the Persian Language Institute at California State University, Fullerton and has interned at the National Iranian Oil Company. Dr. Anders Corr and Matthew Michaelides provided editorial oversight for this article. JPR Status: Working Paper, archived 7/6/2014. “Eqtesad-e Iran dar yek Sal-e Gozashteh,” Aftab, June 14, 2014, accessed: June 29, 2014, http://www.payvand.com/cgi-bin/khayam.cgi?opt=fp&year=1393&month=khordad&day=24; “Rohani dar Eqtesad Movaffaq bood?” Tebyan, June 15, 2014, accessed: June 29, 2014, http://www.tebyan.net/newindex.aspx?pid=279722; “Karnameh-e Eqtesadi-e Rohani,” IRPD Online, June 14, 2014, accessed: June 29, 2014, http://irpdonline.com/2014/06/14/post291/. Brett Logiurato, “Here’s How US-Iran Cooperate In Iraq Affects Nuclear Negotiations,” Business Insider, June 17, 2014, accessed: June 14, 2014, http://www.businessinsider.com/why-iran-wants-to-work-with-us-in-iraq-2014-6; “The Guardian View On US-Iran Cooperation in the Middle East,” The Guardian, June 17, 2014, accessed: June 14, 2014, http://www.theguardian.com/commentisfree/2014/jun/17/us-iran-cooperation-middle-east; Paul Richter, Laura King, and Nabih Bulos, “U.S., Iran Discuss Possible Cooperation Against Iraq Militants,” LA Times, June 16, 2014, accessed: June 17, 2014, http://www.latimes.com/world/middleeast/la-fg-us-iraq-iran-20140617-story.html#page=1; “Steinitz: Isreal Concerned about any US-Iran Cooperation over Iraq,” June 16, 2014, accessed: June 17, 2014, http://www.jpost.com/Iranian-Threat/News/Steinitz-Israel-concerned-about-any-US-Iran-cooperation-over-Iraq-359539; Paul Lewis, Spencer Akerman, Saeed Kamali Dehghan, “Iraq Crisis: US Willing to Work with Iran but Officials Play Down Military Talk,” The Guardian, June 16, 2014, accessed: June 17, 2014, http://www.theguardian.com/world/2014/jun/16/iraq-isis-takes-tal-afar-us-iran-vienna-nuclear-talks; Laurence Norman and Jay Solomon, “U.S., Iran Discuss Crisis in Iraq,” Wall Street Journal, June 17, 2014, accessed: June 17, 2014, http://online.wsj.com/articles/u-s-iran-may-discuss-iraq-at-nuclear-talks-1402922477. “Aya Tahrim-e SWIFT Tavanest Harif-e Bank-haye Iran Shavad?” Iran Young Journalists Club, September 27, 2013, accessed: June 29, 2014, http://www.yjc.ir/fa/news/4570398; “Tavaqof-e Khadamat-e SWIFT beh Bank-haye That-e Tahrim-e Iran, BBC Persian, March 17, 2012, accessed: June 29, 2013, http://www.bbc.co.uk/persian/iran/2012/03/120317_l23_swift_iran_sanctions_band.shtml; “Raf’e Tahrim-e SWIFT Takzib Shod,” Kasbokar (Business) News, September 22, 2013, accessed: June 29, 2014, http://www.kasbokarnews.ir/vdcfm1dy.w6dy0agiiw.html; “Raf-e Moshkelat ba Bardashte Shodan-e Tahrim-e SWIFT-e Bank-i,” Tehran Bourse News Agency, May 14, 2014, accessed: June 29, 2014. “Koreh Varedat-e Naft az Iran ra do Barabar Kard,” Iran’s Oil Ministry Public Relations, March 26, 2014, accessed: April 12, 2014, http://www.shana.ir/fa/newsagency/214280. For a detailed discussion and analysis of this issue, see: Reza Yeganehshakib,“Political Risk to Investment in Iran: Sanctions, Inflation, Protectionism, War, Bonyads, and the IRGC,” Journal of Political Risk, vol. 1, No. 7 (2013), http://www.jpolrisk.com/political-risk-to-investment-in-iran-sanctions-inflation-protectionism-war-bonyads-and-the-irgc/. document No. 65865 available at http://www.iichs.org/index.asp?id=2080&img_cat=130&img_type=1; document No. M 144-7-52 available at http://www.iichs.org/index.asp?id=2101&img_cat=130&img_type=1; document No. M 144-37-6 available at http://www.iichs.org/index.asp?id=2104&img_cat=130&img_type=1; document No. M 144-10-4 available at http://www.iichs.org/index.asp?id=2105&img_cat=130&img_type=1; and document No. P 65823 available at http://www.iichs.org/index.asp?id=2088&img_cat=130&img_type=1. “Ghaleb-haye Tazeh-e Gharardad-haye Nafti be Majles Nemiravad,” Ensaf News, May 17, 2014, accessed: June 29, 2014, http://ensafnews.com/index.aspx/n/5360; “Gharardad-haye Enhesari-e Naft va Moshkelat-e Vaghfeh,” Iran Law Clubs, April 17, 2014, accessed: June 29, 2014, http://www.lawclubs.ir/forum-f58/topic-t1450.html; Sadegh Ghasemi, “Gharardad-haye Be’e Moteghabel, Gozashte va Ayandeh,” Petro Danesh, May 7, 2013, accessed: June 29, 2014, http://petrodanesh.blogfa.com/category/1; “Nazar khahi az Sherekat-haye Khareji baraye Gharardad-haye Nafti-e Jadid,” Iranian Students’ News Agency, January 20, 2014, accessed: June 29, 2014, http://isna.ir/fa/news/92103017440. This Graph has been used from another article by the author publish in Journal of Political Risk in November 2013: “Political Risk to Investment in Iran: Sanctions, Inflation, Protectionism, War, Bonyads, and the IRGC.” Data for Consumer Price Indices from 1992 to 2012 are obtained from UNCTADSTAT, accessed: September 26, 2013, http://unctadstat.unctad.org/TableViewer/tableView.aspx?ReportId=37469; Data for 2013 Consumer Price Indices are obtained from the Website of the Central Bank of the Islamic Republic of Iran. The data provided in the Iranian Central Bank website include General Indices as well as Indices for separate sectors such as food, transportation, and housing. 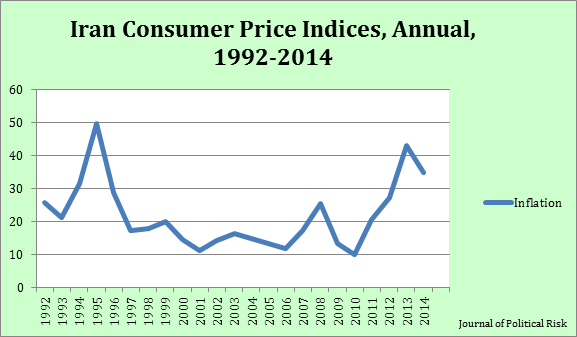 For this chart, the numerical average of the General Indices for the six periods provided by the Central bank has been calculated and used as the Consumer Price Indices for 2013. 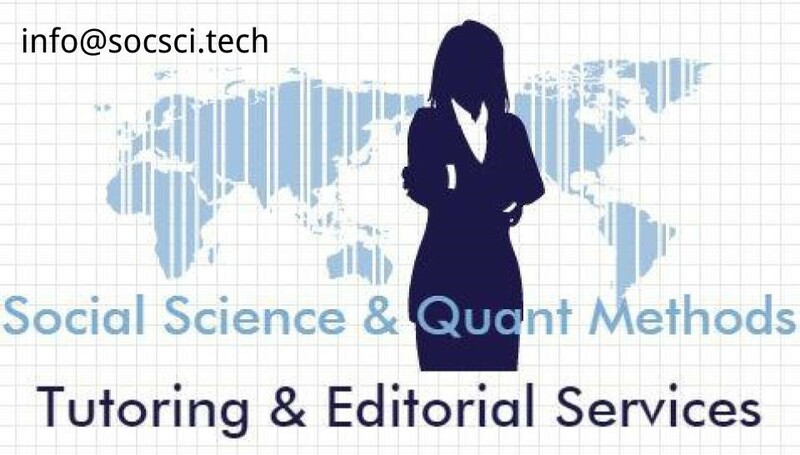 These periods and their allocated Indices are: 42.2% for March 21 to April 20, 41.7% for April 21 to May 21, 45.1% for May 22 to June 21, 44.0% for June 22 to July 22, 43.1% for July 23 to August 22, and 41.6% for August 23 to September 22. 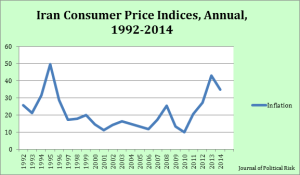 See: “Consumer Price Indices for 2013,” Central Bank of the Islamic Republic of Iran, accessed: November 24, 2013. http://www.cbi.ir/category/1624.aspx; for 2014 inflation rates, an independent source has been used. This source reported the inflation rate 35% while Iran’s central bank reported rate is 22.8% for January 21-Febuary 19, 2014. Since most of independent sources consider 35% closer to the reality in Iran, this rate has been used for this chart. See: The Central bank of Iran, http://unctadstat.unctad.org/TableViewer/tableView.aspx?ReportId=37469. Also See: “Bazgasht-e Jazabiyat be Seporde Gozari,” Donya-e Eqtesad, March 19, 2014, accessed: April 12, 2014, http://www.donya-e-eqtesad.com/news/792691/. 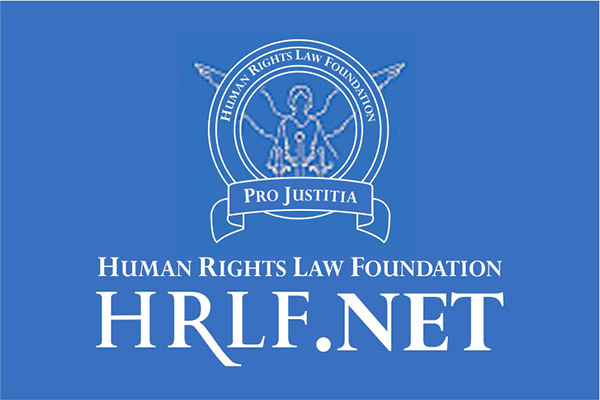 For a detailed discussion and analysis on direct and indirect foreign investment in Iran, See: Yeganehshakib, Reza. “Political Risks to Investment in Iran: Sanctions, Inflation, Protectionism, War, Bonyads, and the IRGC.” Journal of Political Risk, Vol. I, No. 7 (2013). http://www.jpolrisk.com/political-risk-to-investment-in-iran-sanctions-inflation-protectionism-war-bonyads-and-the-irgc/#more-707. 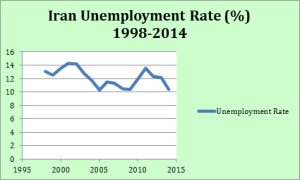 “Annual Unemployment Rates” in Workforce Statistics- Iran Statistics Center, 1998-2014 (1384-1392), http://www.amar.org.ir/Default.aspx?tabid=110, and http://www.amar.org.ir/Portals/0/Files/abstract/1392/ch_niru_z_92.pdf, and http://www.amar.org.ir/default.aspx?tabid=1822. Matthew Lynn, “Are You Brave Enough to Invest in Iran?,” Market Watch, March 26, 2014, accessed: April 12, 2014, http://www.marketwatch.com/story/are-you-brave-enough-to-invest-in-iran-2014-03-26?pagenumber=1. “Bazgasht-e Jazabiyat be Seporde Gozari,” Donya-e Eqtesad, March 19, 2014, accessed: April 12, 2014, http://www.donya-e-eqtesad.com/news/792691/. “Nerkh-e Sood-e Sepordeh dar Kodam Bank Bishtar Ast,” Eghtesad Online, November 2, 2013, accessed: April 12, 2014, http://www.eghtesadonline.com/fa/content/30600. “Mohasebeh Sood-e Sepordeh,” Sarmayeh Bank Portal, accessed: April 12, 2014, http://www.sbank.ir/calculation/func/loadmodule/system/calculation/sismodule/account___rial_account_benefit_calculation.php/sisOp/edit. “Pishbini-e Tavarrom dar sal-e ۹۳,” Payam-e No, March 29, 2014, accessed: April 12, 2014, http://payamno.com/detail=57846; Fereydoun Khavand, “Gerayesh-e Nerkh-e Tavarrom dar Iran dar 1393,” Radio Farda, March 26, 2014, accessed: April 17, 2014, http://www.radiofarda.com/content/f2-iran-economy-inflation-rate-new-year-rohani/25310025.html; “Pishbini-e Tavarrom-e 15 darsadi-e 93 pas gerefteh shod,” Jahan News, March 10, 2014, accessed: April 12, 2014, http://jahannews.com/vdcdfn0snyt0oz6.2a2y.html. “Eghtesad-e Moghavemati,” in the Website of the Supreme Leader of the Islamic Republic of Iran, accessed: April 17, 2014, http://farsi.khamenei.ir/newspart-index?tid=1932. “Olaviyat-e Tose’e Tejarat baraye Tahaqoq-e Eqtesad-e Moqavamati,” Donya-e Eqtesad, June 29, 2014, accessed: June 29, 2014, http://www.donya-e-eqtesad.com/news/811673/. “Minister: Iran’s New Oil Contracts More Attractive to Int’l Investors,” Tasnim News, February 22, 2014, accessed: April 12, 2014, http://www.tasnimnews.com/English/Home/Single/291220. “Iran to Introduce New Oil Contracts in July: Oil Minister Aide,” Press TV, February 2, 2014, accessed: April 12, 2014, http://www.presstv.com/detail/2014/02/02/348898/iran-to-unveil-new-oil-contracts-in-july/. “Iran says it seals gas export, pipeline deal with Oman,” al-Arabiya, March 13, 2014, accessed: April 1st, 2014, http://english.alarabiya.net/en/business/energy/2014/03/13/Iran-says-seals-gas-export-pipeline-deal-with-Oman.html. Allen, Calvin H and R. W. Lynn, Oman under Qaboos: From Coup to Constitution, 1970-1996, (London: Frank Cass, 2000), 65-73. Will Fulton and Ariel Farrar-Wellman, “Oman-Iran Foreign Relation,” American Enterprise Institute, July 21, 2011, accessed: April 1st, 2014, http://www.irantracker.org/foreign-relations/oman-iran-foreign-relations; Daniel Wagner and Giorgio Carfiero, “Can Oman and Iran’s Special Relations Last?,” Huffingtonpost, July 29, 2013, accessed: April, 1st, 2014, http://www.huffingtonpost.com/daniel-wagner/can-oman-and-irans-specia_b_3671994.html; Josef A. Kechichian, “Oman: A Unique Foreign Policy,” RAND Monograph Report, 1995, accessed: April 1st, 2014, http://www.rand.org/pubs/research_briefs/RB2501/index1.html. “Global Business in Iran Database,” American Enterprise Institute, 07/11/2008, accessed: April 1st, 2014, http://www.irantracker.org/global-business-in-iran/projects/nioc-ooc-develop-kish-oil-field-pipeline. “Iran, India, Oman Set to Discuss Undersea Gas Pipeline,” Press TV, February 28, 2014, accessed: June 6, 2014 http://www.presstv.com/detail/2014/02/28/352649/iran-india-oman-mull-undersea-gas-line/; “India-Oman Gas Pipeline: Not Just A Pipeline Dream – Analysis,” Eurasia Review, March 21, 2014, accessed: June 5, 2014, http://www.eurasiareview.com/21032014-india-oman-gas-pipeline-not-just-a-pipe-dream-analysis/; Rejimon K, “Gas Pipeline Connecting Oman and Iran to India Discussed in Tripartite Talks,” Times of Oman, March 20, 2014, accessed: June 5, 2014, http://www.timesofoman.com/news/30506/Article-Gas-pipeline-connecting-Oman-and-Iran-to-India-discussed-in-tripartite-talks; Indrani Bagchi, “India, Iran and Oman Go Under Sea to Build Pipelines, Changed Geopolitics,” The Times of India, March 1, 2014, accessed: June 5, 2014, http://timesofindia.indiatimes.com/india/India-Iran-and-Oman-go-under-sea-to-build-pipelines-change-geopolitics/articleshow/31227746.cms; Ankit Panda, “India, Iran and Oman Open Talks on Deep Sea Gas Pipeline,” The Diplomat, March 1, 2014, accessed: June 5, 2014, http://thediplomat.com/2014/03/india-iran-and-oman-open-talks-on-deep-sea-gas-pipeline/. Khalid Mustafa, “Iran Almost Abandons IP Gas Pipeline Project,” The International News, April 9, 2014, accessed: June 5, 2014, http://www.thenews.com.pk/Todays-News-13-29620-Iran-almost-abandons-IP-gas-pipeline-project. “Iran Plans to Build Modern Hospitals in Oman,” Tehran Times, March 10, 2014, accessed: June 15, 2014, http://www.tehrantimes.com/politics/114588-iran-plans-to-build-hospital-in-oman. “Iran to Build a Pharmaceutical Factory and Hospital in Oman,” Iranian Research Organization for Science and Technology (IROST), accessed: June 15, 2014, http://www.irost.org/en/content/iran-build-pharmaceutical-factory-and-hospital-oman; “Iran to Build Pharmaceutical Factory, Hospital in Oman,” Fars News Agency, April 24, 2014, accessed: June 15, 2014, http://english.farsnews.com/newstext.aspx?nn=13930204000615. “Jabal Akhdar Water Pipeline to be Ready in One-and-a-Half Years,” High Beam Research, February 24, 2014, accessed: April 11, 2014, http://iranoman.com/news/431. “Petrofac says it has won $2.1bn Oman refinery deal,” Arabia Business, November 25, 2013, accessed: April 12, 2014, http://www.arabianbusiness.com/petrofac-says-it-has-won-2-1bn-oman-refinery-deal-527895.html. Matthew Martin, “Oman’s Orpic Said to Seek $3 Billion Loan for Refinery Upgrade,” Bloomberg, January 29, 2014, accessed: April 12, 2014, http://www.bloomberg.com/news/2014-01-29/oman-s-orpic-said-to-seek-3-billion-loan-for-refinery-upgrade.html. This entry was posted in Gas, Iran, Oil, Syria, WMD by Editor3. Bookmark the permalink.